In July of 2013 the Syrian government controlled around thirty-fourth percent of Syrian territory, and sixty percent of the population. The government and other Shia groups were fighting against Sunni-dominated rebel groups. In 2013, Hezbollah (a Shi’a Islamist militant group based in Lebanon) entered the war to support the Syrian Army, and in the east the Islamic State of Iraq and Levant, more commonly known as ISIL, eventually controlling a third of Syria's territory, oil, and gasoline by July 2014. Since this year (2014) the death toll has risen beyond 190,000 people. It has been reported by multiple sources that the there were severe human rights violations and abuses, resulting in massacres, the use of chemical weapons (devices that uses chemicals to inflict pain or death to humans), and bombings. Due to these violent uproars and acts of violence, around 3 million Syrians escaped the country to countries like Iraq, Egypt, Jordan, etc. as refugees. In March of 1971, Assad proclaimed himself to be president until he died in 2000. This started up the Damascus Spring that contributes to this Syrian Civil war. The Damascus Spring was a period of intense political an social debate, when activists were suppressed by the government. Since his death there has been the secular Syrian Regional Brach that has been the authority of Syria. This essentially means that citizens would only be able to vote or endorse a new president by referendum. A referendum is essential giving citizens multiple choice for accepting or rejecting a proposal; a choice. During 2011, Syria deteriorated into civil disorder against Assad’s government, which led, as of November 2012, to the Syrian civil war. Partial criticism towards Assad started due to religious affiliation in comparison to the rest of the country. Assad came from a religious group called Alawite, which was essentially an subsidiary of Shi’ite Islam that was only about 12% of Syrian population. Where about two thirds of Syria were Sunni Muslims, who disagreed with his religious views. Along with this disagreement where many others. Another was their social economics that were discontent among the conservative Sunni Muslims in some of the poorest locations in Syria. With increasing unemployment rates among the youth, and a degrade in living standards, and steep rises in prices of commodities, the Syrian people faced terrible economic situations. Along with many other reasons for discontent associated with al-Assads government, with many human right violations. The state of Syrian human right violations have been under harsh criticism and investigated by global organizations. From 1963 to 2011 the country was under emergency rule which banned public gatherings more than five people, intense crack downs for arrest, and in February 2010 revolutions began to arrive in Tunisia and Egypt all contributing to similar events that appeared in Syria, starting the rise of the Arab Spring. The amount and use of heavy and chemical weapons were very important during the Syrian civil war. This was in particular was one of the most violent with ranges of casualties in comparison to many of the other countries tied to the Arab Spring. The use of chemical weapons was one of the most sever. 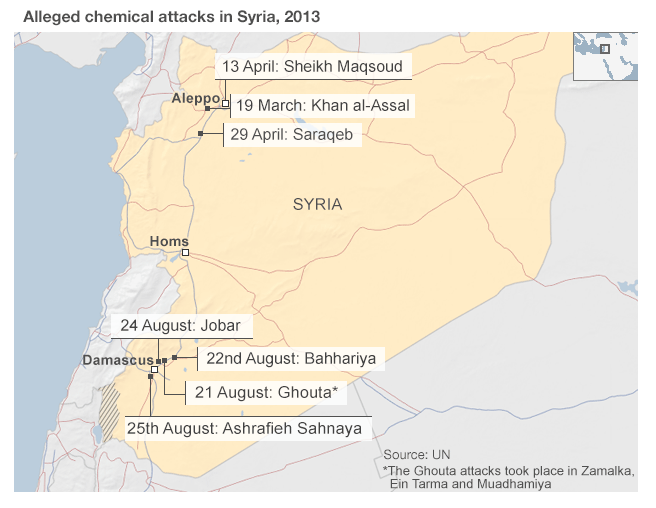 It was reported that over 16 chemical weapon attacks were counted for during this time. The use of Sarin gas was reported, which is a weapon of mass destruction, causing death within 1-10 minutes of inhalation. The use of these sort of weapons on civilian protesters is against all human rights. Chemical weapons along with bombings and missile attacks were unnecessary and inappropriate for any situation. As some of the countries such as Egypt, and Tunisia have had their victories of releasing their authoritarian government leaders and presidents, Syria continues to fight for their rights and their chance to one day celebrate in the square like Egyptians. Syrians continue to protest, and tear down Assad posters in the streets even though they still face major threats. Assad has publicly insisted that the people of Syria love him and support him as a president, but we know that this is a false statement. The reported use of Syrian forces open firing on peaceful demonstrations without warning participants shows the immense corruption the Syrian government truly is, but no matter the outcome in the brutal and blood repression of the quest to remove Assad from Syria, the Syrian people will soon get their justice. They continue to fight for their freedom even through the crack downs and use of major weapons. As of today, November 2014, Assad has still not stepped down even through peace efforts and the countless protests. Albayrak, Ayla (5 October 2011). "Turkey is adding to pressure on Damascus". Wall Street Journal. Retrieved 28 November 2014. Landis, Joshua (29 July 2011). "Free Syrian Army Founded by Seven Officers to Fight the Syrian Army". Syria Comment. Retrieved 28 November 2014. Hubbard, Ben (17 July 2013). "Momentum Shifts in Syria, Bolstering Assad's Position". The New York Times. Smith, Laura. 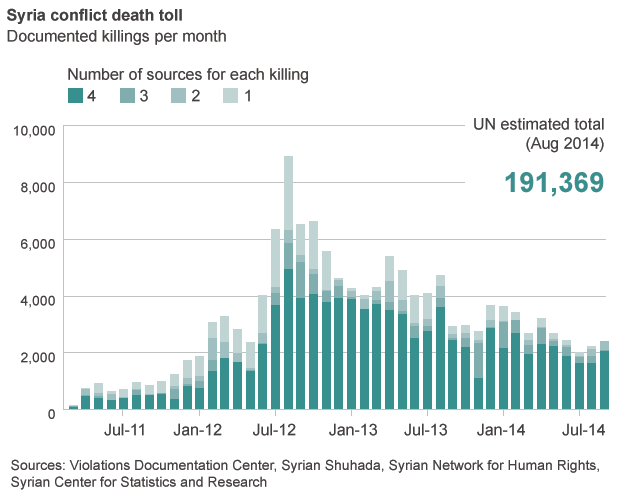 "More than 191,000 dead in Syria, UN rights chief slams 'global paralysis'". CNN. Retrieved 28 November 2014. Heneghan, Tom (3 December 2011). "Syria's Alawites are secretive, unorthodox sect". Reuters. Retrieved 28 November 2014. "World Report 2010 Human Rights Watch World Report 2010", p. 555. Retrieved 28 November 2014. "Syria: Mounting Casualties from Cluster Munitions". Human Rights Watch. 16 March 2013. Retrieved 28 November 2014. "Statistics for the number of martyrs". Violations Documenting Center. 3 June 2013. Retrieved 28 November 2014.